The peach hand is 10 feet long. The hand is 10 feet above the ground. The hand is facing up. The hand is leaning 60 degrees to the northwest. The needle is -3 feet above the hand. The needle is 3.5 feet long. The needle is leaning 45 degrees to the northwest. The needle is 2 feet to the left. A silver wall is on the ground. The wall is facing down. The wall is 20 feet high and 20 feet long. The ground is water. The silver microscope is on the wall. The microscope is 10 feet tall. The silver flask is in front of the microscope. 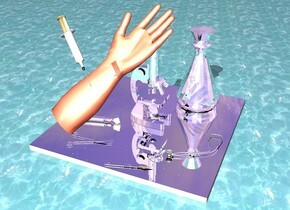 The silver flask is right of the microscope. The flask is 10 feet tall. The dull silver stethoscope is in front of the microscope. The stethoscope is left of the microscope. The stethoscope is 6 feet tall. The stethoscope is facing down. The silver scalpel is 1 foot behind the stethoscope and 1.8 feet to the west. The scalpel is 5 feet long. The scalpel is facing down. The scalpel is facing west. The silver scissors is 2 feet east of the scalpel. The scissors is north of the scalpel. The scissors is 5 feet tall. The scissors is facing down. The silver otoscope is 2.5 feet east of the scissors. The otoscope is 5 feet tall. The otoscope is facing down. Medicine Man and Pit the healing dog. one huge man is 5 feet above ground. the man faces down. the man faces east. one huge dog is .5 feet below man. second huge swimmer man is 1 feet to right. one huge first aid kit is 25 feet behind dog.